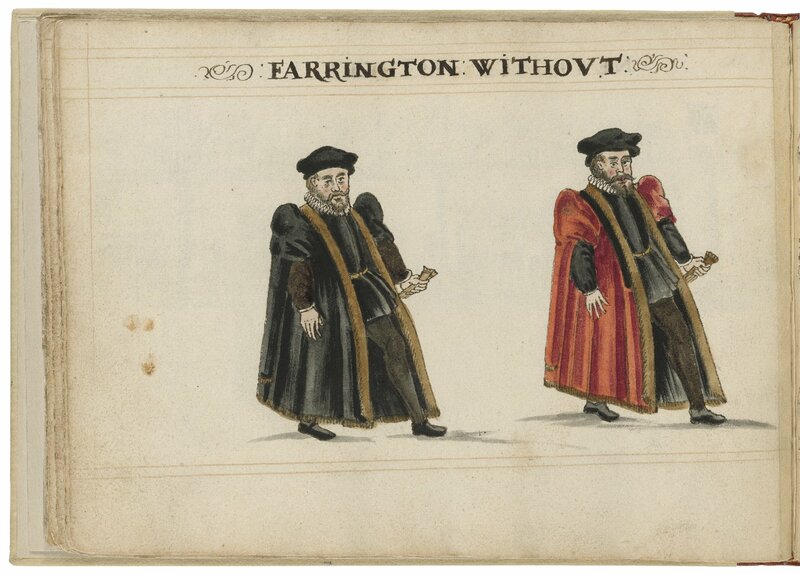 Watercolour painting of the alderman and deputy in charge of Farringdon Without Ward by Hugh Alley. Image courtesy of the Folger Digital Image Collection. The boundes of which ward without Newgate and Ludgate are theſe. Firſt on the eaſt part thereof, is the whole precinct of the late priorie of ſaint Bartholomew, and a part of Long lane on the north, towardes Alderſgate ſtreete and Ducke lane, with the hoſpitall of ſaint Bartholomew on the Weſt, and all Smithfielde to the Barres in ſaint Iohn ſtreet. Then out of Smithfield Chickelane toward Turmile brooke, and ouer that brooke by a bridge of timber in the field, then backe againe by the Pens (or folds) in Smithfield, by Smithfield pond to Cow lane, which turneth toward Oldborne: and then Hoſiar lane out of Smithfield, alſo toward Oldborne, till it meete with a part of Cow lane. Then Cocke lane out of Smithfield, ouer againſt Pye corner, then alſo is Giltſpur ſtreete, out of Smithfield to Newgate, then from Newgate weſt by S. Sepulchres church to Turnagaine Lane: to Oldboorne Conduit, on Snor hill,1 to Oldboorne bridge, up Oldboorne hill to the Barres on both ſides. On the right hand or north ſide, at the bottome of Oldboorne hill, is Goldlane, ſometime a filthy paſſage into the fields, now both ſides builded with ſmall tenementes. Then higher is Lither lane, turning alſo to the field, lately repleniſhed with houſes builded, and ſo to the Barre. Now on the left hand or ſouth ſide from Newgate, lieth a ſtreet called the Old Bayly, or court of the Chamberlaine of this citty: this ſtretcheth downe by the wall of the Cittie unto Ludgate: on the weſt ſide of which ſtreete, breaketh out one other lane, called ſaint Georges lane, till ye come to the ſouthend of Seacole lane and then turning towardes Fleetſtreete, it is called Fleete lane. The next out of the high ſtreet from Newgate turning down ſouth, is called the little Bayly, and runneth downe to the Eaſt of ſaint Georges lane. Then is Seacole lane which turneth downe into Fleete lane: neare unto this Seacole lane, in the turning towardes Oldboorn Conduit, is an other lane, called in record wind againe Lane, it turneth downe to Turnemill Brooke, and from thence backe againe, for there is no way ouer. Then beyond Old boorn bridge to Shooe lane, which runneth out of Oldboorne unto the Conduit in Fleeteſtreet. Then alſo is Fewtars lane, which likewiſe ſtretcheth ſouth into Fleetſtreete by the eaſt end of ſaint Dunſtons church, and from this lane to the Bars, be the bounds without Newgate. Now without Ludgate, this warde runneth up from the ſayd gate to Temple barre, and hath on the right hand or north ſide the ſouth end of the old Bayly, then downe Ludgate hill, to the Fleet lane ouer Fleete bridge and by Shooe lane, and Fewters lane, and ſo to New ſtreete (or Chancery lane) and up that Lane to the houſe of the Rolles, which houſe is alſo of this ward, and on the other ſide to a lane ouer againſt the Roules, which entereth Ficquets field. Then hard by the Barre is one other lane called Shyre Lane, becauſe it diuideth the Cittie from the Shire, and this turneth into Ficquets field. From Ludgate againe on the left hand, or ſouth ſide to Fleetebridge, to bride lane, which runneth down by Bridewell, then to Water lane, which runneth down to the Thames. Then by the White Fryers and by the Temple, euen to the Barre aforeſaid, be the boundes of this Faringdon Warde without. Farringdon Without Ward. The Map of Early Modern London, edited by Janelle Jenstad, U of Victoria, 20 Jun. 2018, mapoflondon.uvic.ca/FARR2.htm. Farringdon Without Ward. The Map of Early Modern London. Ed. Janelle Jenstad. Victoria: University of Victoria. Accessed June 20, 2018. http://mapoflondon.uvic.ca/FARR2.htm. 2018. Farringdon Without Ward. In J. Jenstad (Ed), The Map of Early Modern London. Victoria: University of Victoria. Retrieved from http://mapoflondon.uvic.ca/FARR2.htm. Also known as Smithfield Pond.